Next, Cod. The little piece of cod was sous vide; because the cooking temperature was well-controlled, the meat texture turned out very nice. 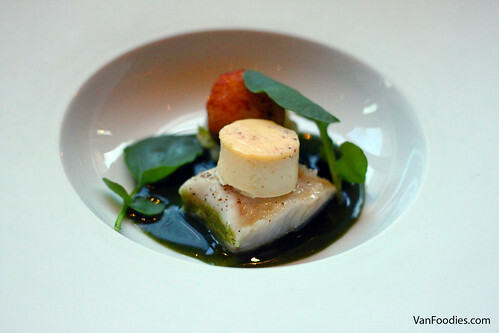 The cod piece was very lightly seasoned so there was a contrast between that and the earthy, grassy watercress sauce. The egg flan on top was rich and creamy, and the fried ball was flavourful. Third, Seabream. I really liked the crispy skin on the seabream and the fish was seasoned well. The artichoke shell with slow cooked octopus was very interesting. The crispy artichoke reminded me of potato skin, but octopus pieces were a bit too small for my liking so I couldn’t really enjoy the bouncy texture of the octopus. This was my favourite of the three seafood courses. Fourth, Pork Belly, which was first sous vide then fried. It’s so tender, it just melted in my mouth! The fatty part didn’t feel greasy at all. The flavour reminded me of having a German style roasted pork knuckle, perhaps just a touch too salty. 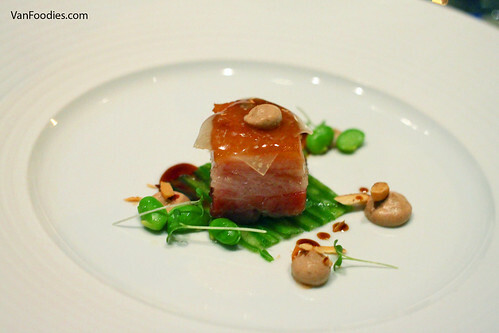 Because the pork belly was very rich, it’s nice to have the green bean and soy bean to add some freshness to the dish. And crispy almond for crunch. Fifth, Braised Beef Cheek. This was a generous portion. 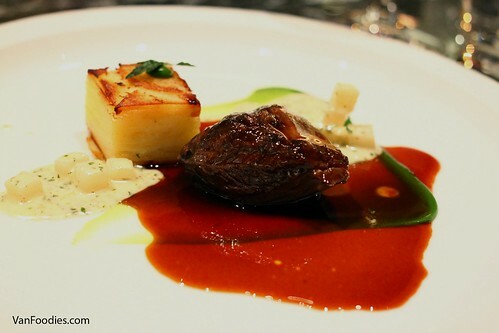 The beef cheek was fork tender, rich, luscious. The potato gratin was thinly sliced, creamy; one of the best ones I’ve had. I quite enjoyed the three different sauces on the plate, including the cream sauce with some crunchy kohlrabi cubes, as well as the herbaceous parsley drizzle. Lastly, Apple Strudel, a deconstructed version. Love the sweet and tart combination of the apple and raisins. The brown butter ice cream was silky and creamy. 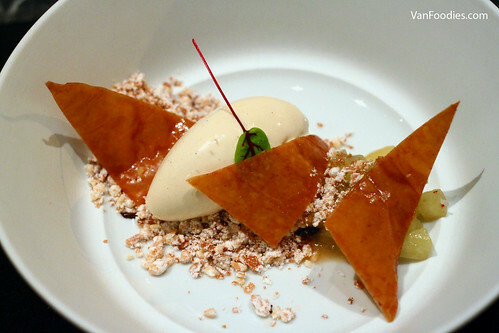 The almond crumble and cinnamon crisp added texture to the dish. A really nice end to our dinner. 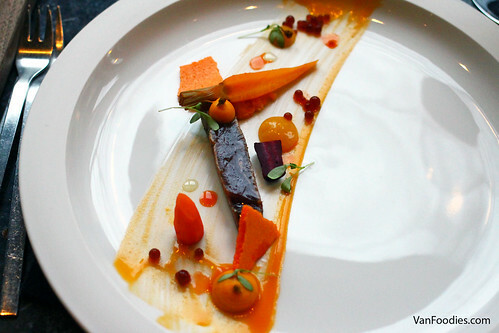 Knowing that this was a tasting menu, I didn’t expect big portions. That being said, at first I still thought it’s a bit too small in terms of portion size. The featured protein was devoured in two bites max. But as the dinner progressed, it seemed to be just the right amount of food. At the end, we weren’t overly stuffed, but we left the restaurant feeling satisfied. However, while everything was nicely executed and the plates were absolutely gorgeous, I’m not sure if this was representative of the restaurant’s “contemporary German” style cuisine. 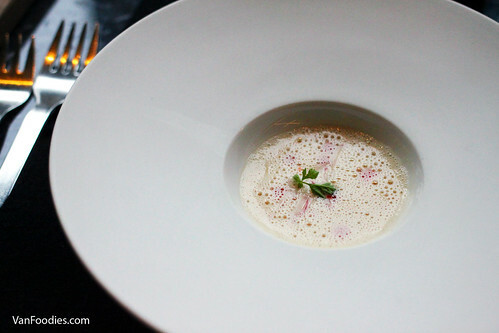 There are a number of German style dishes on the a la carte menu, and I wish they would’ve included some familiar German preparations or flavours in the tasting menu. I felt that the menu could’ve been served at any Pacific Northwest/Westcoast restaurants in Vancouver and it would be deemed fitting. It left me wanting more out of the menu. 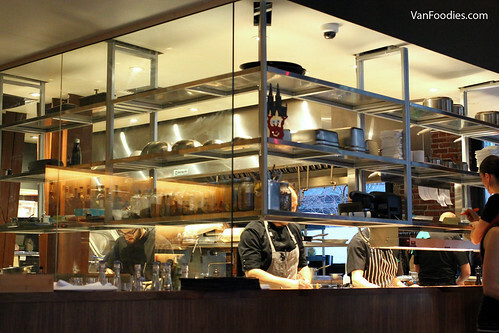 The interior of the restaurant didn’t strike us as an upscale, fine dining restaurant (of course, we were comparing to others in the category such as Hawksworth, Blue Water Cafe, Market and West). 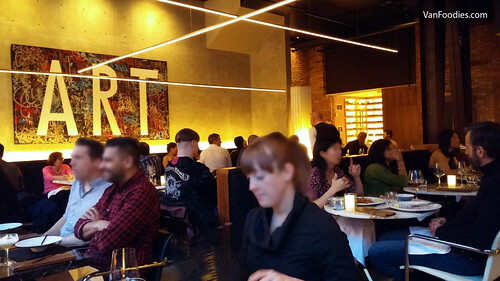 It’s not the typical white-tablecloth restaurant. But the combination of high ceiling, exposed pipes, and industrial art decor was perfectly fitting for the Gastown neighbourhood. The bathroom was a bit of a surprise for us. We weren’t expecting that kind of “artsy” approach in a restaurant bathroom. I won’t spill it here; you will just have to go see it yourself! 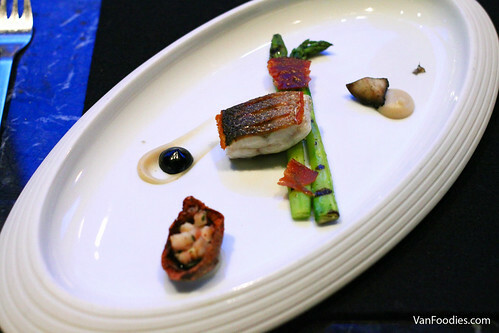 Overall, it was a great selection of ingredients, with interesting and well-executed preparations. I thoroughly enjoyed each dish. 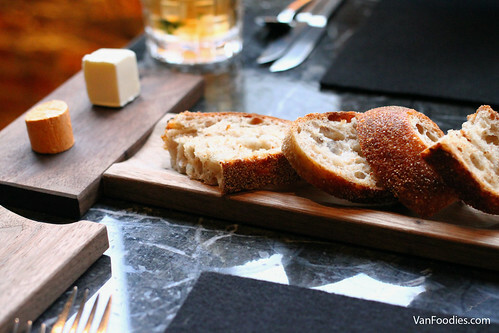 The tasting menu costs $95 for the 6 courses, and I was lucky enough to only pay $60 for it. I do wish there’s some more German elements in the dinner. I guess I’ll just have to go back for its a la carte menu.